The motion of looking around an object is one of the most important motions achieved by the translational motion of the neck; without moving the robot, the flanks of an object placed in front of the robot can be recognized. 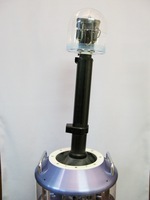 In the design of the overall appearance of the robot, we have considered many points: adequate range of motion in spatial positioning of the head, sufficient agility for tracking the master motion of the operator’s head, slenderness and lightness for high portability, and a small footprint and good mass balance for location independence. In addition, the pan axis is allocated at the end of the DOF because we assume that motion parallax is a very important factor in an active visual system for teleoperation. We have designed and developed the most appropriate HMD for TORSO and TORSO-HMD system as telexistence visual system.